While Jeff Bezos has yet to grow a white beard, or gain 300 lbs, Amazon is the closest we will get to Santa’s workshop. The Northpole might not be as functional as the 80 worldwide fulfillment centers that this merry-man has under his belt. The 100,000 plus employees are being helped this season with a robotic elf army, and this is welcomed news as Cyber Monday’s sales were up 15% from last year. As we reported two years ago, Amazon acquired Kiva Systems for $775 million. Kiva, a Massachusetts-based startup, makes warehouse robots and software to automate the most mundane parts of filling online orders, e.g. sorting, pick-n-pack, and moving inventory. This past Sunday, on the eve of the high point of the internet retail year, Amazon opened its doors to show off its army of Kiva droids that are taking its warehouses to the next level of consumer gratification. The big surprise is that Kiva is now joined by “Robo-Stow,” one of the largest robotic arm in existence, and various vision AI systems. However, I’m sorry to report, there were no drones flying above delivering packages like Rudolph and his reindeer buddies. In short, Amazon said it’s expanding the use of “Robo-Stow,” which it describes as “one of Earth’s largest robotic arms moving large quantities of inventory for customer order fulfillment.” It’s also using new “vision systems” to unload delivery trucks in a half-hour, as opposed to the hours it took previously. “The Amazon fulfillment teams are dedicated to innovating in our fulfillment centers to increase speed of delivery while enabling greater local selection at lower costs for our customers,” said Dave Clark, Amazon’s senior vice president of worldwide operations and customer service. The first impression at any Amazon warehouse—the company calls them “fulfillment centers”—is the noise. Plastic bins rattling over rollers, conveyer belts brimming with packages, hissing machines slapping labels onto boxes—the warehouse is in its self a well oiled machine in constant motion. Unlike older versions of its fulfillment centers, this one has zones of quiet at its heart, and this is the den of the Kiva bots. Inside black chain-link cages on four floors, swarms of Kiva bots glide silently along an invisible grid. The squat orange automatons look like the smaller cousins of bumper cars, except they never collide. On their “backs,” the 320-pound robots carry shelves standing several feet taller than their human attendants outside the cage and weighing up to 750 pounds . 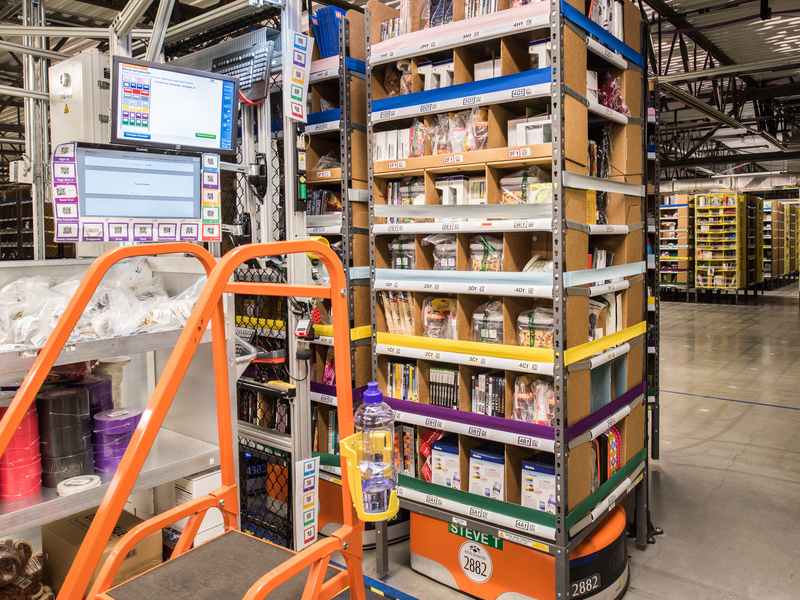 Each shelf is stuffed with bins on all four sides that hold inventory—coffee mugs, Crayola markers, GoPro lens protectors, USB cables, or just about any other of around 3.5 million different items stocked by Amazon at its San Francisco warehouse, known by its call sign as OAK4. The moving shelves serve two main purposes. When inventory arrives at the fulfillment center, items have to wait somewhere before someone orders them. In the traditional process known as “stowing,” a person walks the aisles with a cart and shelves the items. With the Kiva robots, Amazon workers wait at stations for the shelves to come to them, where they load up each one with inventory while the other robots queue politely behind. In the second part of the process, called “picking,” orders come in, and pre-Kiva, pickers would walk the aisles to the bins storing the needed items. Now the shelves come to the pickers instead. Amazon gains two major advantages by using robots instead of people to move the merchandise, says Dave Clark. Because aisles aren’t needed between shelves to make room for human pickers, more items can be stored more closely together, he says, enabling a fulfillment center to hold more stuff. And the time saved by eliminating the need for humans to walk to where items are makes the movement of items in and out the door more efficient. Right now, Clark says OAK4 holds 21 million items total in its inventory. Once the fulfillment center is entirely built out with its full Kiva cohort, it will hold 26 million items total, representing 5 million different products. On a peak day, he says, OAK4 can ship out 700,000 items. By the time it’s fully operational, he says, that number will rise as high as 1.5 million. 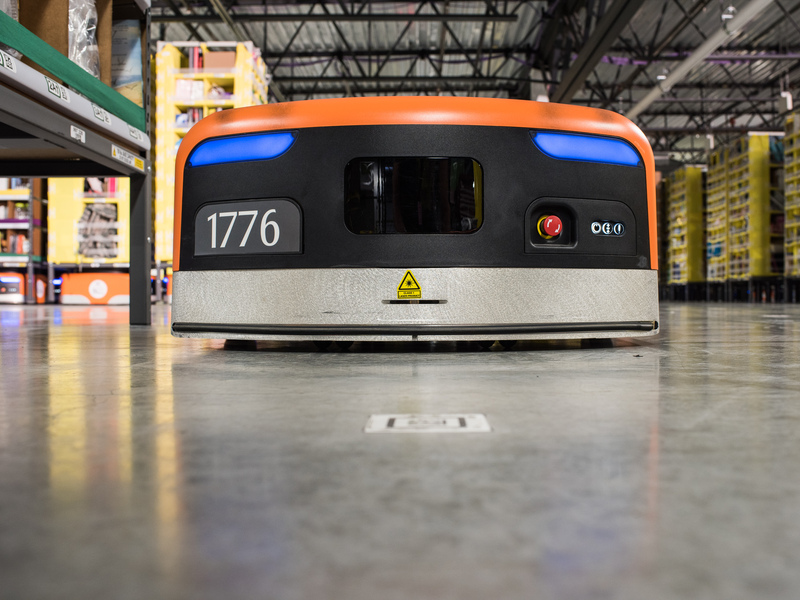 In the US, Amazon now has a workforce of 15,000 Kiva robots deployed across 10 of its 50 domestic fulfillment centers. Another fulfillment center in California has the massive robot arm, the “Robo-Stow,” capable of lifting entire pallets from one floor to another. The efficiency gains mean moving more orders more quickly, which among other effects will eventually push back the current noon cutoff time for same-day delivery orders to later in the afternoon. Since displaying its robotic muscle, many reporters have innocently asked, “But if robots move Amazon’s merchandise faster while costing less overall, won’t Amazon try to find ways to replace as many of those human workers as possible?” Clark responded correctly that the rise in productivity will give Amazon the means to grow. And growth means Amazon will need to hire more people. While some were quieted, others still criticize with the same fingers that just ordered their latest Amazon Prime delivery. The holiday season is upon us, and more important than presents is giving. Here is one suggestion of a worthy charity: UJA NY.